There will be a new curling rink in Cupar! At least that was the impression I was left with after the open meeting last night in the main hall of Elmwood College in the town. More than eighty interested souls attended to listen to the presentation by the Fife Curling Trust. The story goes back to March 2007 when the original ideas for a rink to serve the needs of the local community were launched. Much has happened in that time, the project group being shunted up a branch line for a while with its, ultimately unsuccessful, application for the National Curling Academy project. However, the group has now returned to its original focus for a four sheet facility which will be simple, functional, comfortable and built in a cost effective way. It was an interesting meeting. David Steel is the chairman of the charitable trust that has been set up to make the project happen. He took the major role to discuss the details - why, where and how. He says, "Location is critical to the success of the project." Cupar ticks all the boxes for a new Fife rink. It is important to realise that if the rink goes ahead it will be the first new rink to be built in Scotland which is not a direct replacement for a previous facility since Forfar was opened in 1989. Hence, much of David's focus was on development and how the game could, and should, be grown in the area. Elmwood College, the likely site, has 400 staff and 850 full time students. It also has a Sports education Department. It is just across the road from Bell Baxter school, one of the biggest in Scotland with 1900 pupils, and there are other high schools in the area which could access the facility. And St Andrew's University is just a few minutes along the road. The development emphasis was directed to the young, given the aging demographics of club membership, not just in Fife, it should be said! All the clubs, many with a long history, could benefit from an influx of new members, and that is certainly the group's focus to attract more young people to our sport. But the key to the success of the project is the more than 700 curlers who live in the local area, and the meeting was really directed at trying to guage what support they would give to the new venture. The total cost is £1,000,000. If the trust can raise a quarter of this, then funding from sportscotland for half the total is likely to become available. The remainder can, in theory, be raised from other sources. Raising a quarter of a million pounds then is the primary target. I was impressed by how the group intend to do this. We all left the meeting last night armed with donation forms, direct debit mandates, gift aid forms. But that's only the start. Several fundraising schemes were outlined by Jim Steel, another key member of the project group, and will be launched soon. Small ones such as the Crampit Club and the Webshop have been running for some time (see here). Is £250,000 a feasible target? Of course it is. I wonder if there are other philanthropists in the wider area that would like to see the project succeed. 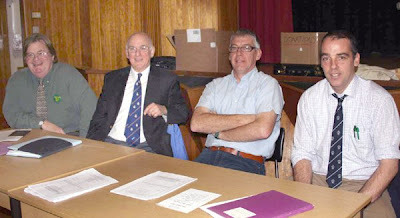 If there are, then Andrew Stevenson, the Fife Curling Trust secretary and treasurer, is your contact. His address is The Pend House, 29 High Street, Earlsferry, Leven, Fife KY9 1AF. Or contact the Trust here. The orator of the project group is Alan Stuart! (Actually he was World Scotch Pie Champion in 2007 see here, and purveyor of Iron Brew saugages, but that's another story, here). To him fell the job of winding up the meeting. "Let's build an ice rink - it slips off the tongue so easily," was how he began. After complimenting the determination, tenacity, vision and enthusiasm of David Steel, he stated boldly to the assembled curlers and interested parties, "Tonight we must decide whether you are all still with us." 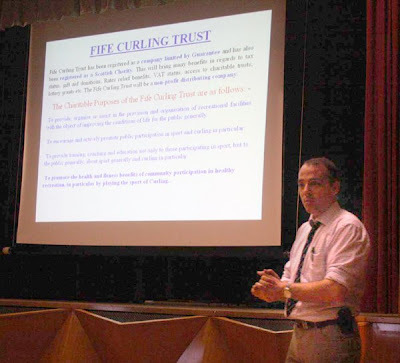 In exhorting curlers in the local two Provinces to open their purses and wallets, he said, "Think not of what curling can do for you, but what you can do for curling. And remember just how much curling has done for you already." "Just pause for a moment, close our eyes and picture the best wee ice rink in Scotland!" I left Cupar for the long drive home heartened and optimistic. I admire the work that the dedicated group have already put into the project. But my route home though took me past Ratho, the site of the stalled Gogar Park replacement project. It was then that the significance of what is happening sunk in. The whole future of curling in Scotland is at stake. If curlers support the project whole-heartedly and help to raise the money needed, then I have no doubt that a new successful rink will be built. But if the support is not offered, then the rink will not go ahead. What chance then will there be for any future development and expansion of curling in this country? If Cupar cannot do it, then who can? I'll be watching the Fife Curling Trust's efforts with interest, and supporting these. I hope you will too. Top: David Steel during his presentation. Above: Last night's four presenters. L-R: Alan Stuart, Andrew Stevenson, Jim Steel, David Steel. 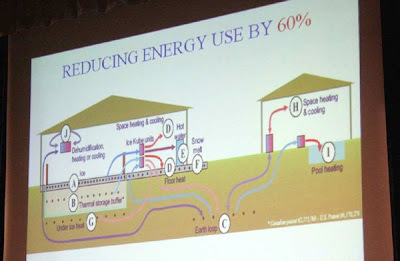 One innovation in the plans for the new rink is the use of geothermal energy. See here. Thanks very much for your very positive support. Your positive comments are most welcome and much appreciated. I still have real concerns that when push comes to shove, we will struggle to raise the funds but the Committee is not going to give up easily. The negativity you encounter does get you down, but the thought of that "best wee ice rink in Scotland" will keep us going. Thanks once again for your support and for the Pie 'n' Brewbanger plug! You are living in dreamland. Why Cupar and the site in question? Try applying to the sheriff court to build on common good land for a start.